This very well-attended event began against the backdrop of doubtful weather. 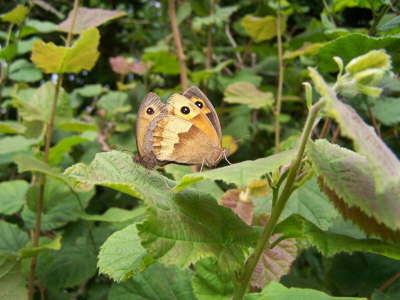 After searing heat on Friday and Saturday, Sunday was cool, overcast and windy, not a good sign for a butterfly outing. A consoling thought was my retention of three lovely specimens caught the previous day to show at the event. But shortly after the meeting time of 2pm, the cloud thinned and the sun shone kindly, providing a comfortable heat. A Silver-washed Fritillary, Dark Green Fritillary and a micro moth Pyrausta purpuralis were shown to great interest and appreciation from everyone there, and the fritillaries, being recent emergents, looked especially lovely. Posing nicely for photographs, all three took to the air and off we went. The plan for the walk involved walking two adjoining but distinct habitats. The first area is mainly shattered limestone pavement with scattered scrub. This area was very disappointing. The thin soils here hold little moisture regardless of the weather conditions but the persistent heat and lack of precipitation has resulted in a starkly parched limestone grassland. 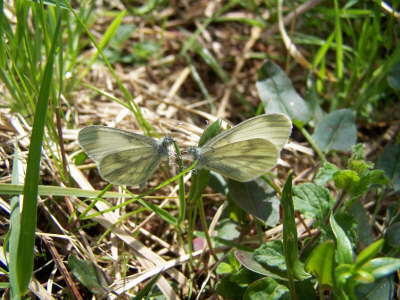 The ground vegetation is largely a withered grey and straw colour, and butterflies and moths appear to have deserted the limestone. 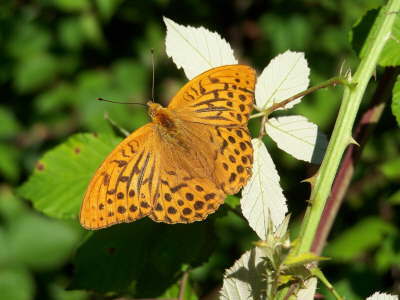 Even violet plants in semi-shade, used by the Pearl-bordered Fritillary were seen to be in the early stages of desiccation. 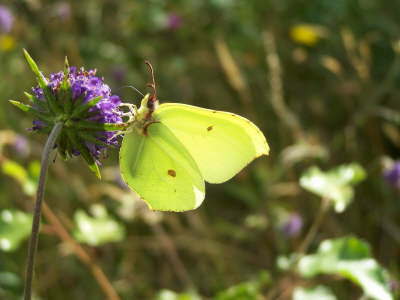 At this stage of the summer, we could expect Common Blue, Dark Green Fritillary, Grayling, Small Heath among others here but only about five individual butterflies were seen on the limestone. A change of scene was needed. We walked to the adjoining site which consists of deeper soil with tall grassland and scattered limestone pavement. 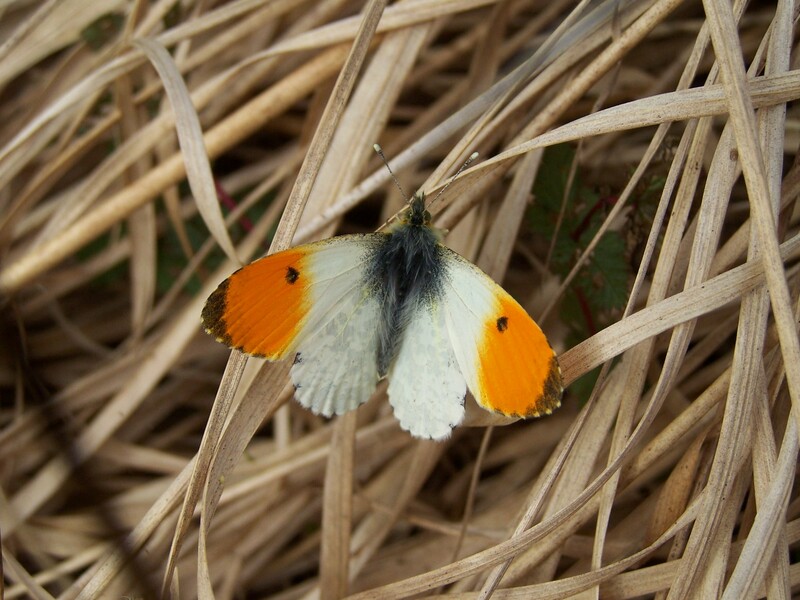 Our luck changed with Common Blue, Small Tortoiseshell, Dark Green Fritillary, Grayling, Meadow Brown, Ringlet and Small Heath netted and shown. 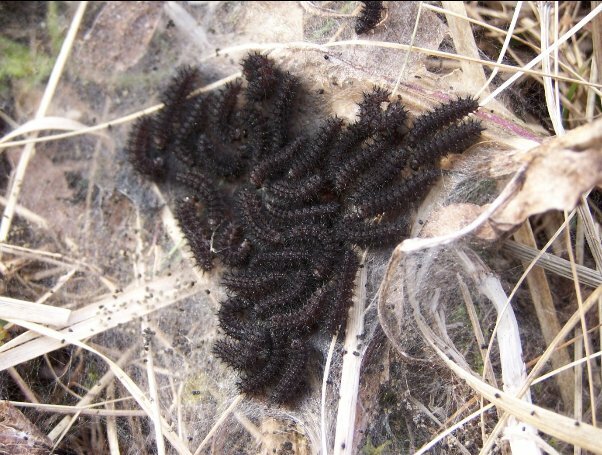 Marsh Fritillary eggs laid on the underside of a Devil’s-bit Scabious leaf were shown. 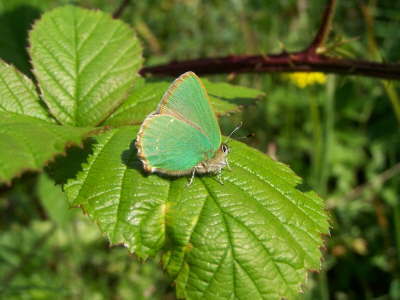 This butterfly has finished flying and is succeeded by its larger cousin, the Dark Green Fritillary which has two large communal roosts on the site. 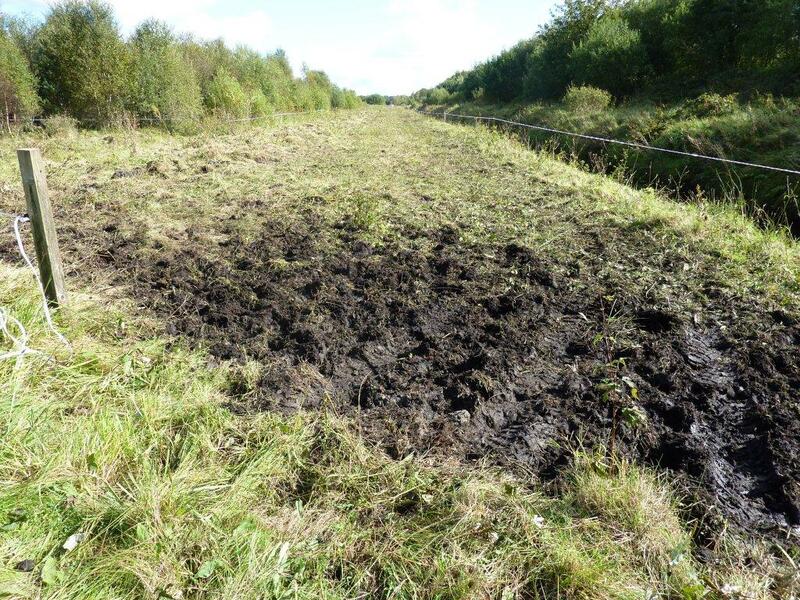 However, a sobering reminder of life’s ephemeral beauty was afforded by the discovery of a killing ground containing the dismembered remains of dozens of the Dark Green Fritillary, as well as a Four-spotted Chaser dragonfly. A keen-eyed predator may have found the roost and if so, is exploiting this larder. It is the first time I have witnessed this concentration of dead specimens. The sight of the colourful wings arbitrarily adorning grey limestone reminds one of the final line of the poem Butterflies (by Rosita Boland): “Gaudy and ephemeral”. 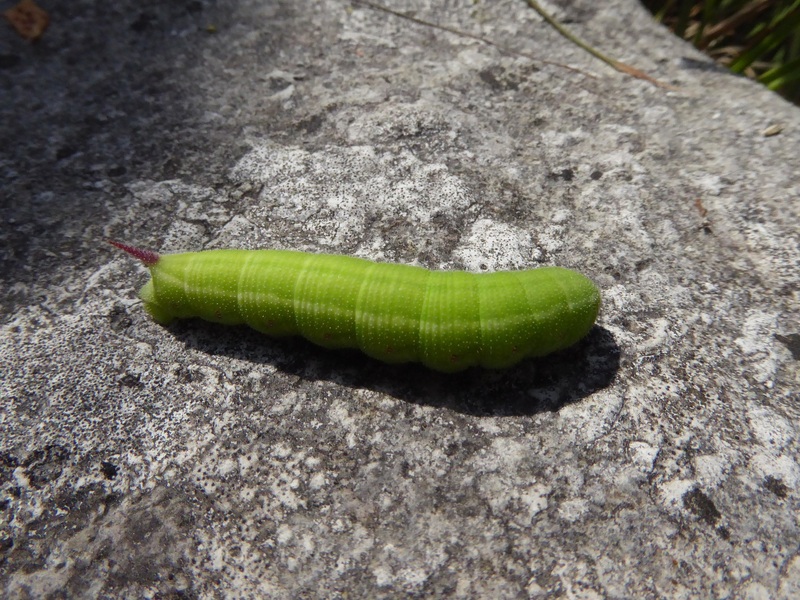 One creature that appears safe from the unknown but probable avian predator is a fully-fed Narrow-bordered Bee Hawk-moth larva, which was found barreling over limestone on its way to pupate. On a cheery note, the female Common Blues present were the blue mariscolore form, one of our loveliest butterfly sights. 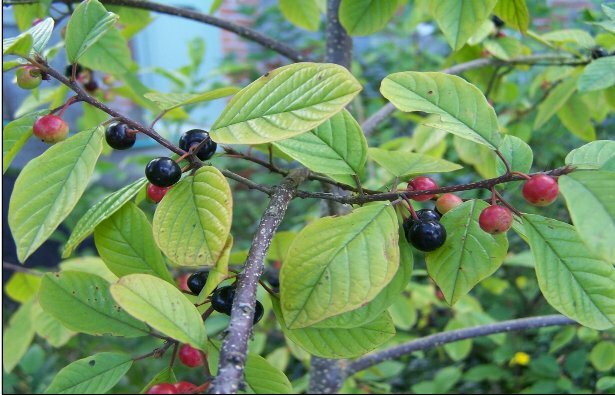 This occurs usually in the north and west and its occurrence in these areas may be an ecological response to a generally cooler, wetter climate. 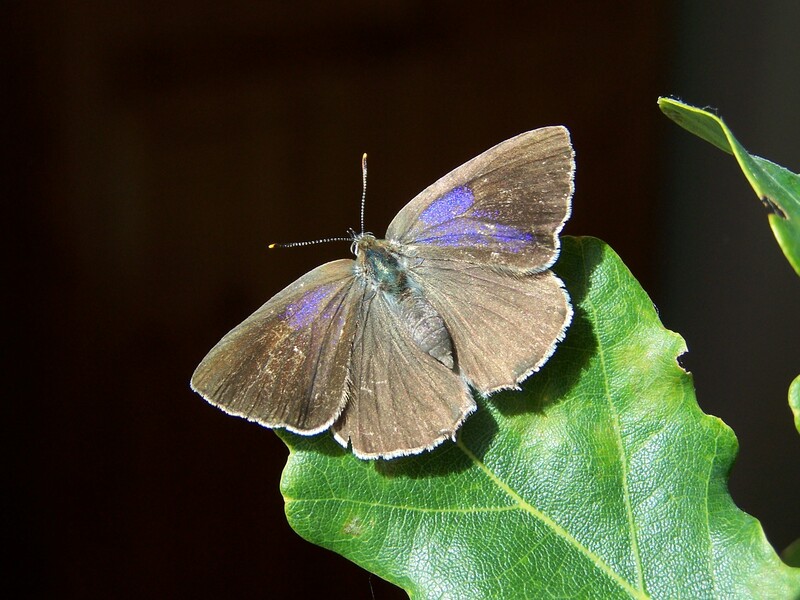 Further east where rainfall is lower the females are more inclined to have brown upper wings but in Clare blue is more prevalent. 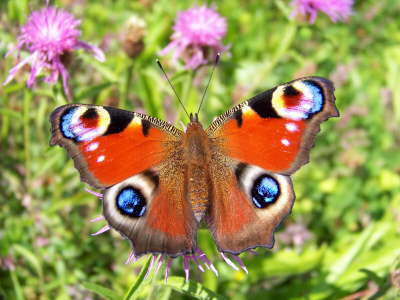 We watched a Grayling heat up on limestone, a Small Heath patrol a patch he was compelled to share with Ringlets. We wondered would there be as many specimens of the grass-feeding butterflies here next year if the current drought continued. We will not say this too loudly, but it needs to rain! Thanks to all who made the event so pleasurable, especially Burrenbeo Trust and to the local farmers in the area for allowing us to walk these beautiful areas. All photographs are © J.Harding. 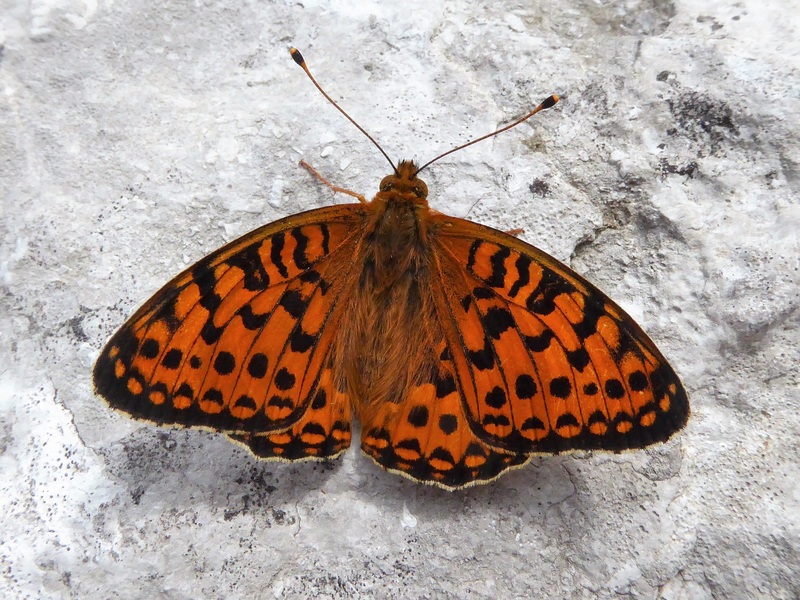 Male Dark Green Fritillary basking on limestone. 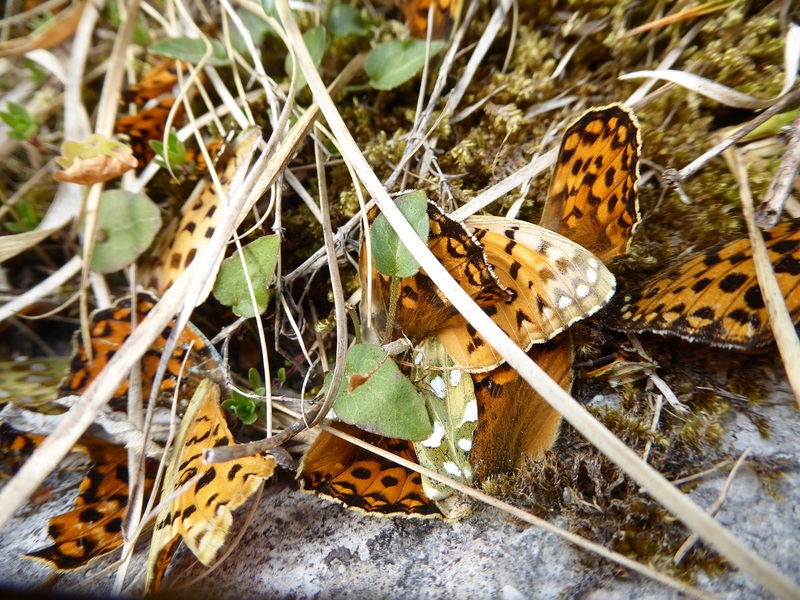 Dark Green Fritillary graveyard at Fahee North. This Narrow-bordered Bee Hawk-moth larva is off to seek a pupation site. It will fly next year, most likely during May 2019.